Oregon's Creswell Chronicle recently featured an article about The National Anthem Project, a patriotic effort to spotlight the importance of school music education by MENC: The National Association for Music Education. This widely publicized effort by MENC will culminate on Flag Day, June 14, when bands choirs and orchestras representing every state in the national will gather on the National Mall in Washington, D.C., for the singing of the "The Star Spangled Banner." Drum Corps International will join in the festivities providing the backdrop for the grand finale of The National Anthem Project when it kicks off its 2007 Summer Music Games Tour on June 16 in Annapolis, Md., with the DCI Salutes America event. 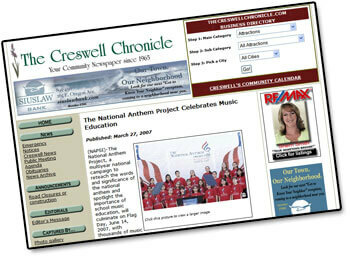 Read this article on www.thecreswellchronicle.com. Learn more about the DCI Salutes America major event.